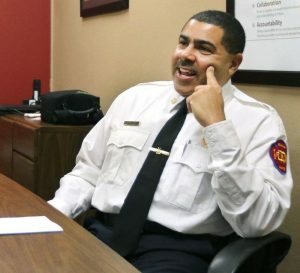 Thumbs-up: To DeKalb’s newest fire chief, Jeff McMaster. A 23-year veteran of the DeKalb Fire Department, McMaster was named the department’s interim chief Thursday. He talked this week about his work at the department, including the many years he worked alongside Eric Hicks, who retired from the department this week, in part, Hicks said, as a cost-saving measure. McMaster has spent most of his career serving the city of DeKalb and often accompanied Hicks to various events around the community. He will take over a department that is certain to face future budget challenges, but he knows the community well, and we hope for his success, both in his interim period as the department’s leader and in whatever his role may be going forward. Thumbs-up: To a local woman who puts her crocheting skills to good use. This year, Deena Kerwin of DeKalb crocheted 440 scarves for all of the students, staff and teachers at Jefferson Elementary School. Each scarf took an hour and a half to two hours to crochet. She’d made scarves for children taught by her daughter, third-grade teacher Kate Farris, last year. But this year she decided to do more. “I started thinking of the other students, the other children. It was a big task, 440 scarves, but I thought, ‘Why not?’ ” We’re glad there are people such as Kerwin in the community who use their talents to help others. Great work! Thumbs-down: To a scary new invasive insect species. The Asian longhorned tick has been found in Arkansas, Connecticut, Maryland, New York, North Carolina and Pennsylvania. It has been found on pets, livestock and people. The tick species, which is native to China, Japan and the Korean Peninsula, is a major livestock pest that has plagued farmers in Australia and New Zealand for years, including sucking so much blood from dairy cattle that it reduces milk production by 25 percent, according to the Washington Post. The tick’s bites also can cause hemorrhagic fever in humans, a condition that kills 30 percent of its victims. The ticks that belong in North America are trouble enough. We hope these pests don’t reach Illinois. Thumbs-up: To everyone who lent a hand to a friend, a neighbor or a stranger during the recent burst of cold and snowy weather this week. Whether you used your snowblower to clear the sidewalks or driveway of someone else, jump-started someone’s car or were one of the people out driving plow trucks during the recent blizzard, good on you. There’s something about winter weather that makes people pull together – and if you lend a hand when you can, odds are someone will step up and help you in the future.